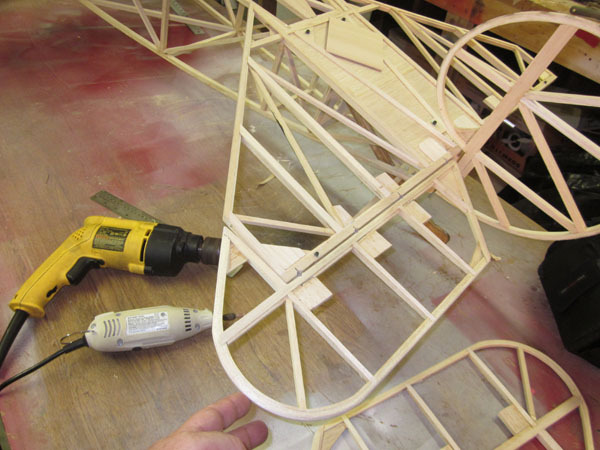 There’s an old saying in the hobby that goes: “Once you’re finished “building” your scale RC airplane, you’re only half done!” That’s because all our efforts of gluing and bolting parts together leads up to one final goal—producing a smooth and even surface to apply the covering to. With any fabric covering job, the end results are only as good as the surfaces being covering. 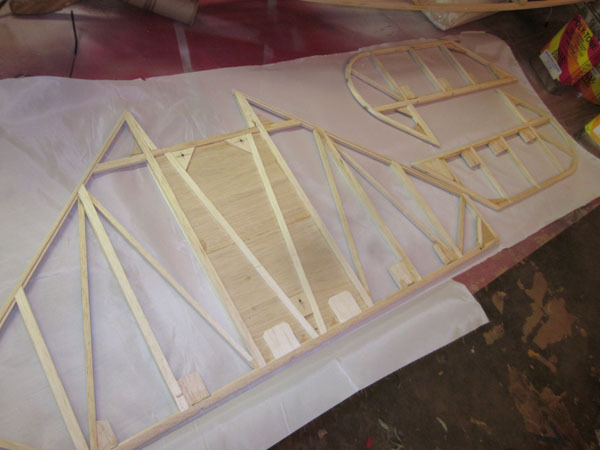 An average covering job applied over a good, even and well-sanded structure will look much better than an excellent covering job done over a poorly built, rough structure. So before going any further, go over your plane with a fine-tooth comb. Sand and fill and sand again, any imperfections or uneven edges and joints. Use a tack cloth to clean the surfaces and use your fingertips (with your eyes closed), to feel the surfaces. Once everything is nice and smooth and clean, we can start covering! You need to remove all the hardware and things like control horns, pushrods, hinges, servos, engines, etc. 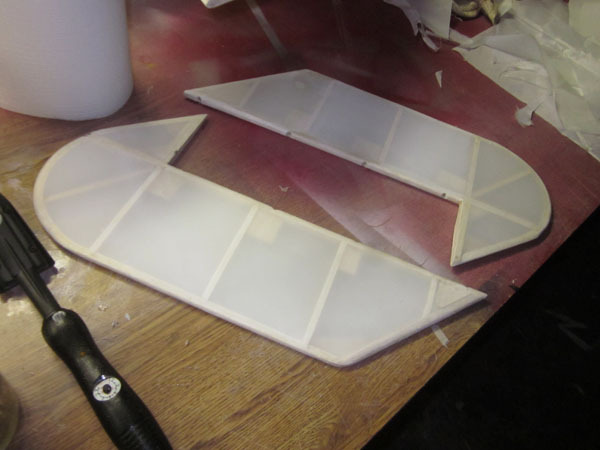 Then go over everything and make sure the airframe is smooth and has no broken glue joints. 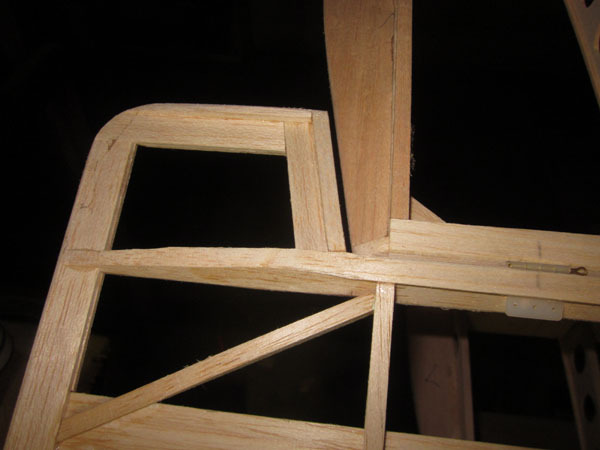 All your edges need to be rounded and sanded smooth. 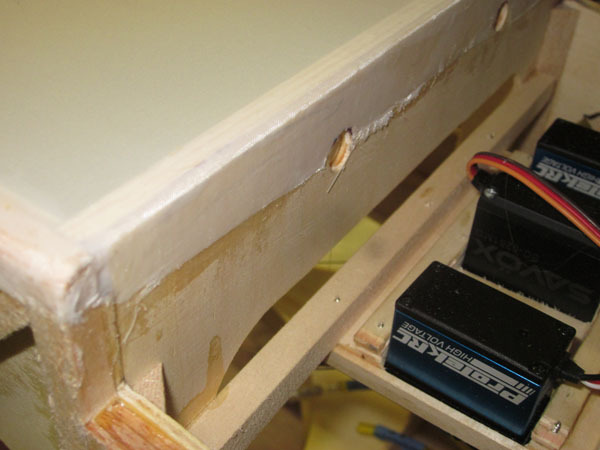 Save all your hardware in a handy container so you can easily find everything after covering is complete. 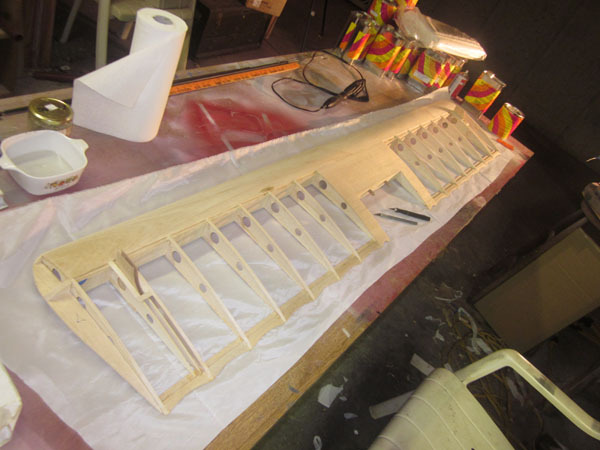 For my Balsa USA 1/3-scale Fokker Triplane, I’m using the Stits Lite cloth and the Poly Tone finishing system. available from F&M Enterprises. 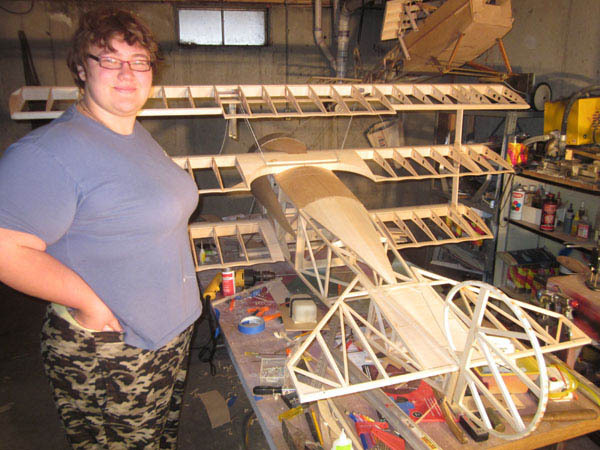 I have been using this material since 1995 and have covered a dozen scale models all with great success. The fabric, adhesive, sealer and paint are all formulated to work together and F&M Enterprises doesn’t recommend or guarantee the results if you use any other fabric or substitute other materials. With that said, I have finished models with Stits Lite applied over SuperShrink fabric from Coverite, but the finished model did require some reshrinking after a season or two of flying. All my Stits Lite fabric covered models, have never required reshrinking to remove sags or wrinkles, even after years of flying. You’ll also need: a sharp hobby knife and replacement blades, a covering iron, ½ inch and 1 inch sable hair brushes, paper towels, and MEK (methyl-ethyl-ketone) solvent for thinning the glue and cleaning up your brushes and spray equipment. 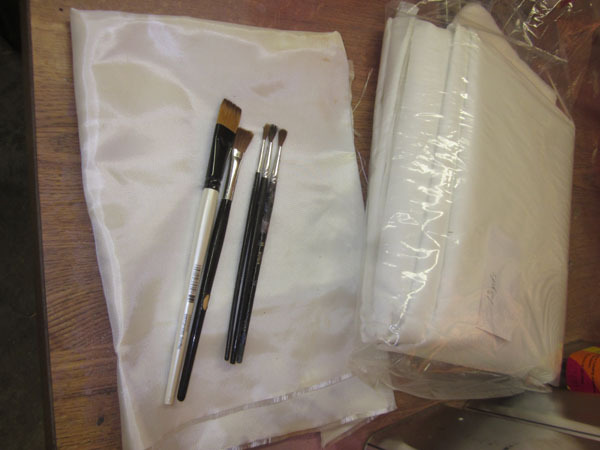 Keep your fabric covering material in its bag until you are ready to cover your plane. Then keep the unused material safe and away from the area where you are gluing the material to the model. 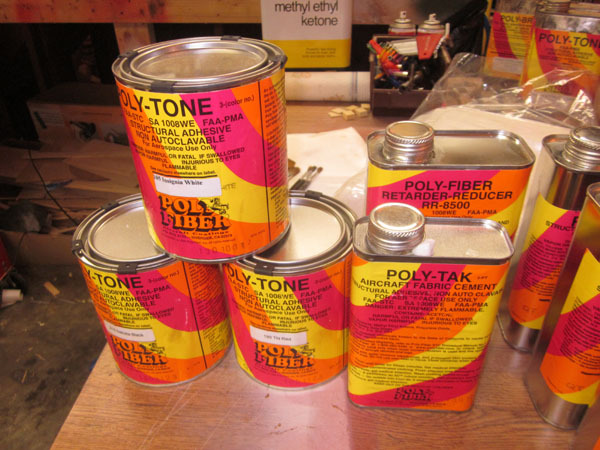 MEK is universal solvent and is very good for cleaning up and thinning Poly Tak glue. Don’t use it to thin the Poly Tone paint however. Reducer is used for that. Now clean off your workbench really good and then gather the covering materials. 1. Place the control surface over the fabric and cut it to size leaving about an inch of material all around. It is very important to use sharp knife blades and replace them often. The fabric dulls the blades quickly. Get a 100-count pack of #11 X-Acto or Hobbico blades. Once you cut the first piece of fabric, go ahead and cut a second piece for the other side. The fabric has no inner or outer surface. 2. 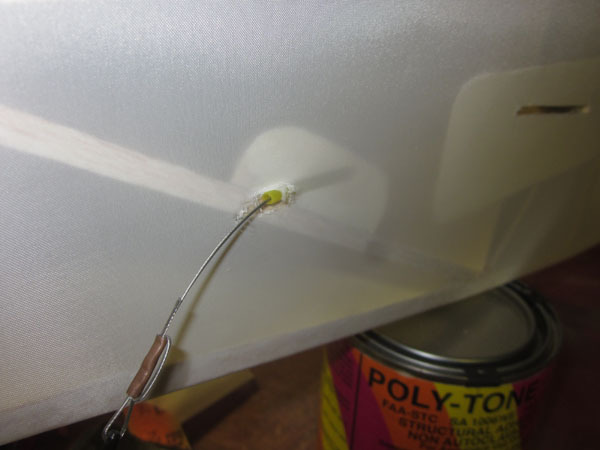 Pour some Poy-Tak adhesive into a glass container that has a twist-on lid and use your ½ inch brush to apply some adhesive all around the outer edges of the rudder. The glue dries quickly so apply it quickly a few inches at a time as you go. 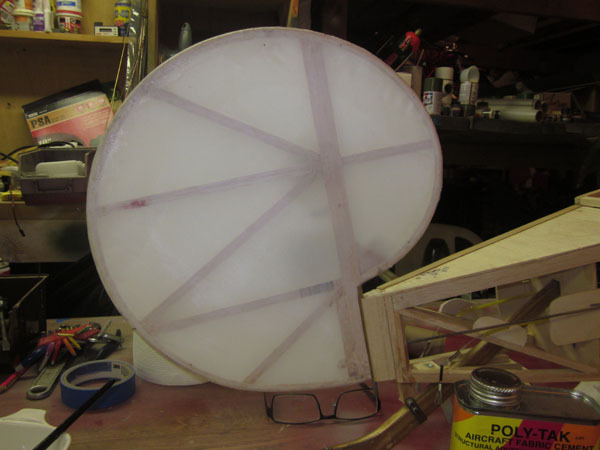 By the time you apply glue to a second control surface, the first will be dry and ready to go. 3. To begin attaching the fabric to the control surface apply more adhesive working in short 2 to 3 inch sections and press the fabric down onto the wet glue. Rub it down smooth with your fingers and let dry. This takes only a minute or two. 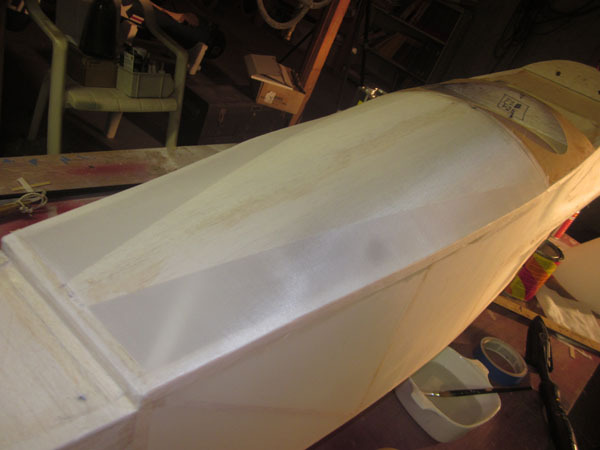 I apply glue in one spot (see top of rudder,) and then pull the material a little to remove any sags and wrinkles and apply glue on the opposite edge. 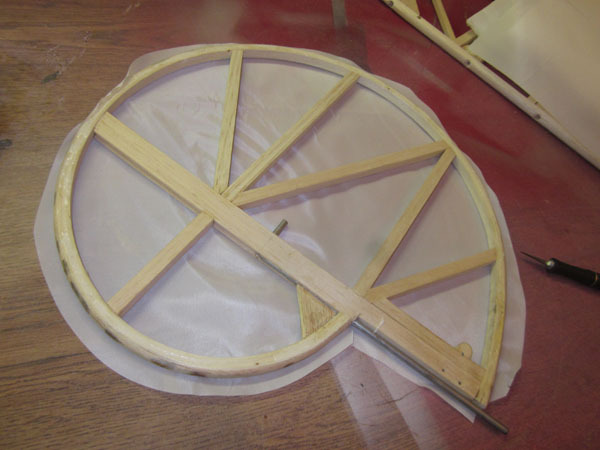 Apply more glue and pull the material again as until all the edges are glued down and the material is wrinkle free. 4. Now turn the control surface over and repeat the process. Apply a little glue, smooth the fabric down and pull the material working a few inches at a time. The fabric should overlap the first side about 3/8 inch around edges. 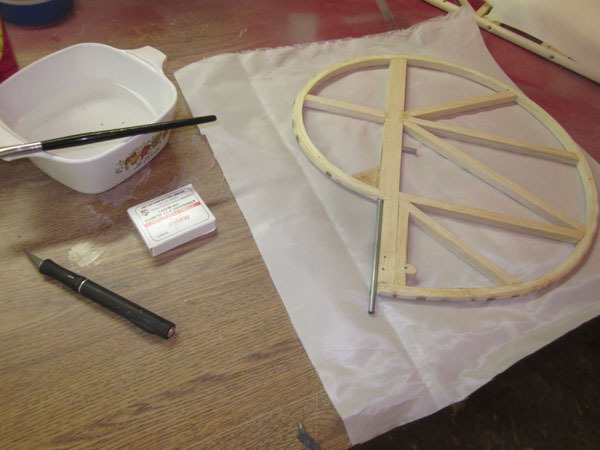 Lift the material up slightly and use a small brush to apply glue where the material overlaps and rub it down smooth. I find it helpful to wait a just few seconds to let the adhesive start to setup then press it down with your fingers. 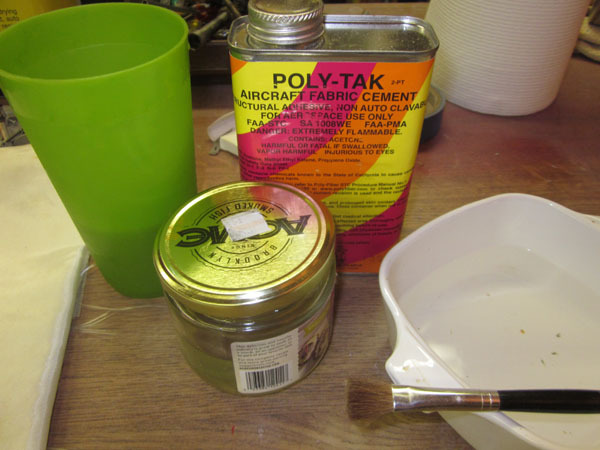 Shop Tip: If you find a stubborn area where the fabric is stuck down uneven, brush a little MEK solvent to the outside of the fabric to reactivate the glue under it. Also, if you drip some adhesive on the outside of the fabric, you can use MEK and a paper towel to remove it before painting. 5. After the adhesive has completely dried, apply heat, (with your iron set at about 250 degrees,) and go over any edges where fabric isn’t completely sealed down. Once the edges have cooled off, apply heat to the center of the control surface and work the iron outward. You’ll be amazed how easily and quickly the fabric shrinks and the wrinkles disappear. 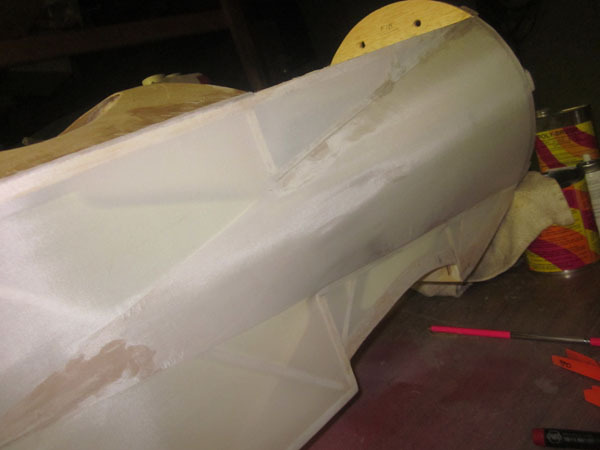 The process is the same for all control surfaces like the rudder, horizontal stabilizer, elevators and ailerons. When covering a model, I like to cover all the control surfaces first to get into the swing of things before moving onto larger structures. 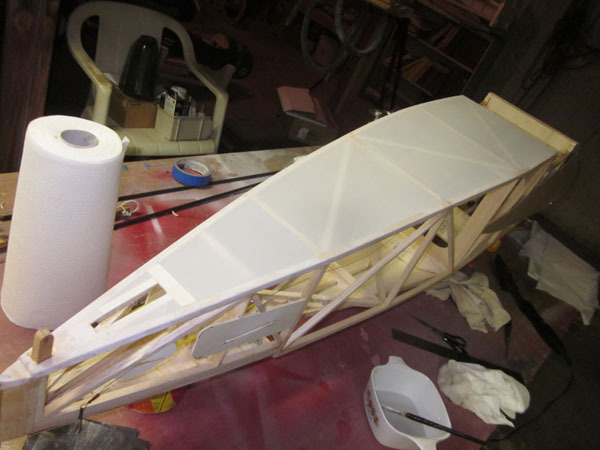 Here’s the stailizer and rudder are completely covered and positioned on the fuselage. Here is a close up of the elevator. Notice the hole for the RObart HingePoints is clear and uncovered. 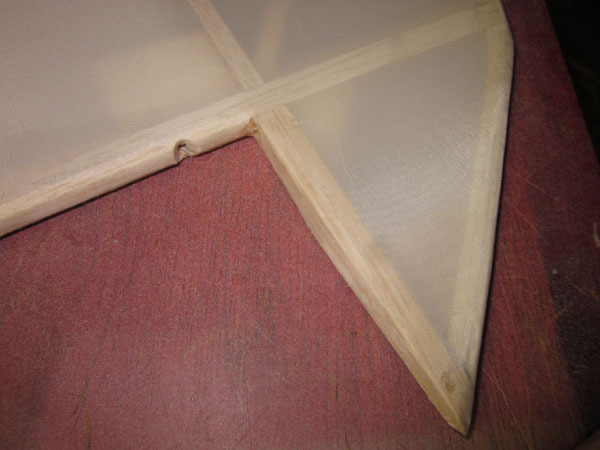 The fabric is glued down neatly around the hinge opening. 6. 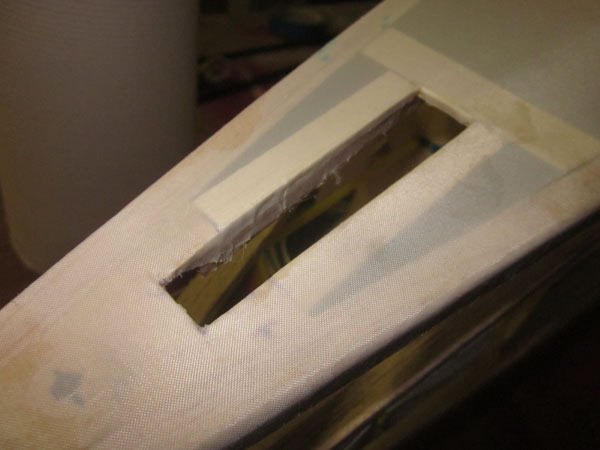 For the fuselage, apply the first coat of glue to where the covering will come in contact with, let dry and cover to the bottom surfaces. 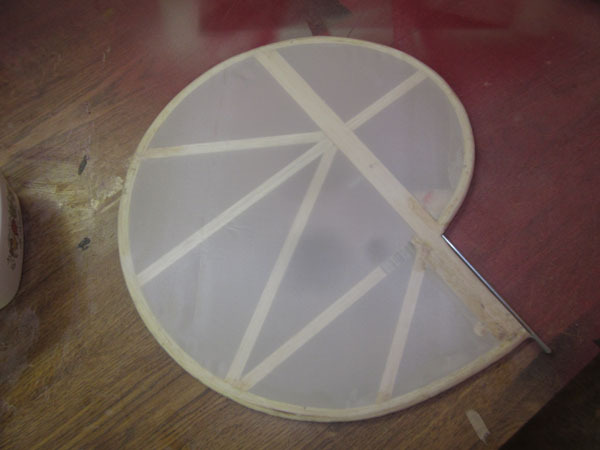 Trim the edges neatly, apply more glue and seal the edges down over the outer edges and onto the sides of the longerons. 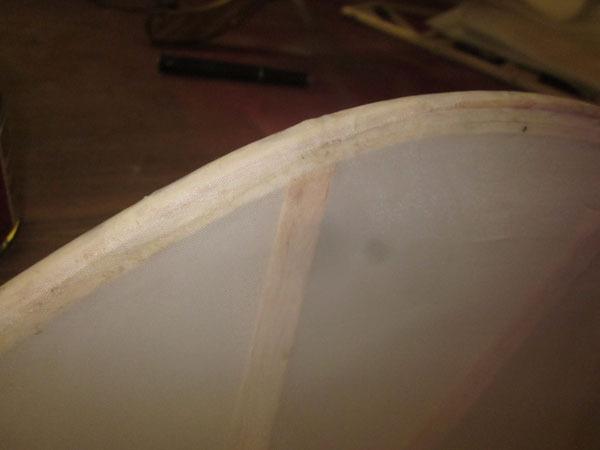 I also cut the material extra long and seal the edges to the inside of the wing saddles and the formers in this area. Do this to any other openings in the fabric like around the tailskid. Work all the wrinkles out before moving to the next surface. Only after all the surfaces are covered and most of the wrinkles have been removed should you apply heat. 7. Once the bottom is covered, treat the vertical sides in the same way. Neatly trim the edges so they wrap around the top and bottom longerons and seal them down with glue and smooth it down with your fingers. 8. 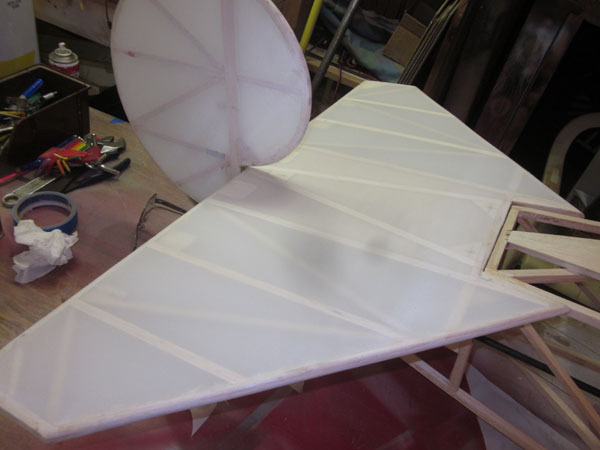 Cover the tail saddle where the horizontal stabilizer sets, first so you can overlap the sides and top covering so they are hidden when the stabilizer is bolted into place. Just take your time and make all your seams neat, straight and smooth. 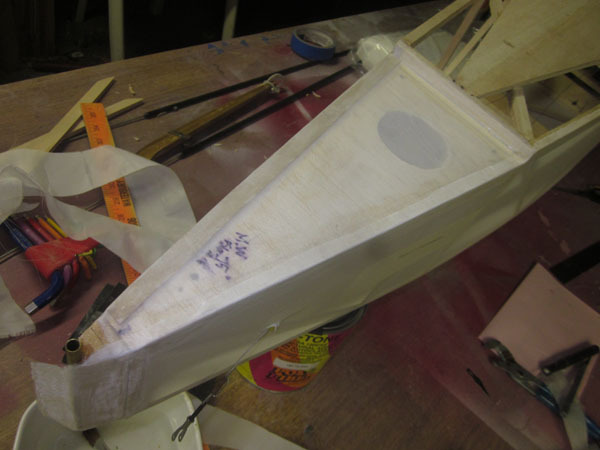 Now apply the covering to the top aft portion of the fuselage and work the material down and seal with glue at the outer edges. Tack it into place at the tail and work forward pulling slack and wrinkles out as your work forward and outward. Trim the material to produce smooth, neat seams. After all the covering material is in place and major wrinkles and slack removed, you can then go over everything with the covering iron set at 300 degrees for a final shrink. Stay away from seams and edges. 9. When you have openings for control linkages, pushrods and control cables, make a small slit in the fabric and slip the hardware through before gluing the fabric in place. Then carefully glue the fabric in place around the area. 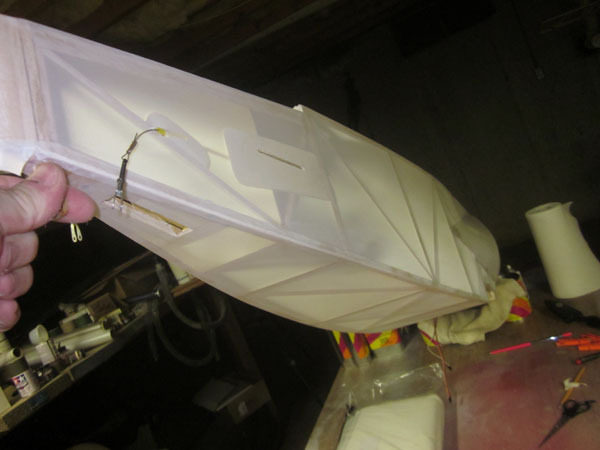 After the model has been covered and painted you can add scale fairings and patches to support the fabric. 10. You should also apply plenty of glue to the supporting structures around the control exits so you have a strong fabric bond. This will prevent wrinkling at these areas. 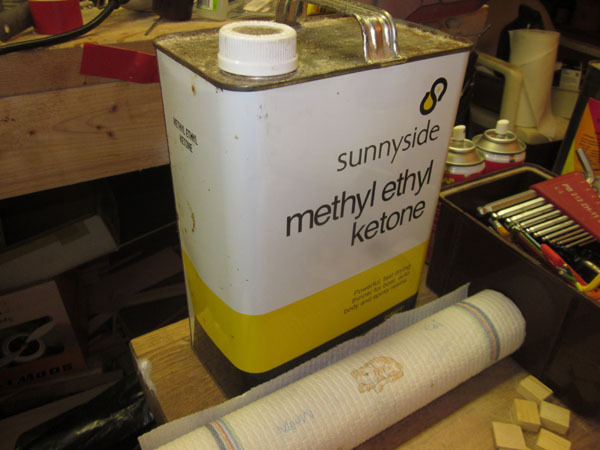 Safety Tip: MEK solvent is a strong, dangerous chemical and should always be used with caution. 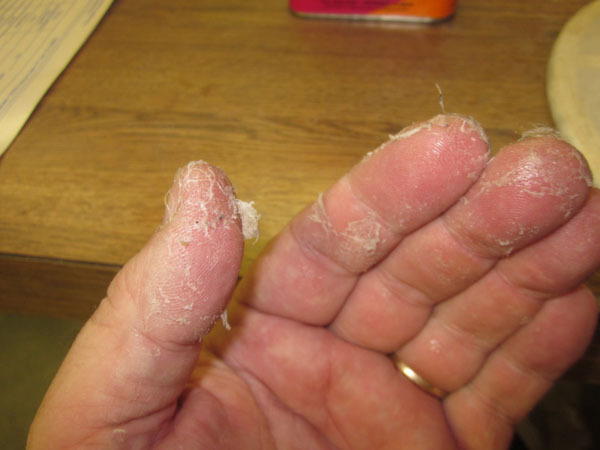 It is also strongly recommended that you use chemical proof gloves, or use a barrier cream like “invisble gloves” (available from F&M Industries) to prevent the solvent from absorbing into your skin. This hand cream also makes it very easy to clean off dried glue from your fingers. That’s it for now. Stay tuned and I’ll be back with tips and techniques for covering the wings.